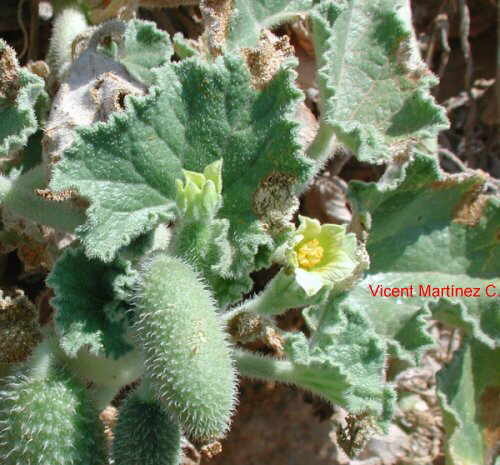 Perennial herbaceous plant of the gourd family -cucurbitaceae- till 60 cm long. Fleshy leaves, triangular or heart-shaped, rough when touched because of the presence of many straight hairs upon them, downy below. Yellow flowers -you can find whiter samples like the one in the photograph- somewhat bell-shaped. Egg-shaped fruit, 4 or 5 cm long, covered with bristled hairs, which opens in maturity, throwing away the seeds and the liquid inside it at a considerable distance. In waste lands and near rubbish.